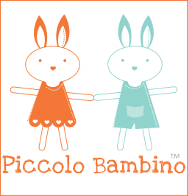 It's Paleo AND gluten free! I love most prawn recipes but Chilli Prawn Linguini has to be one of the most delicious and satisfying dishes going. And it’s so easy!! Within the time it’s taken you to cook your pasta, it’s ready. It’s what I call a “real” 15-minute meal. Not one of those ones that require 30 minutes of prep before 15 minutes of cooking! 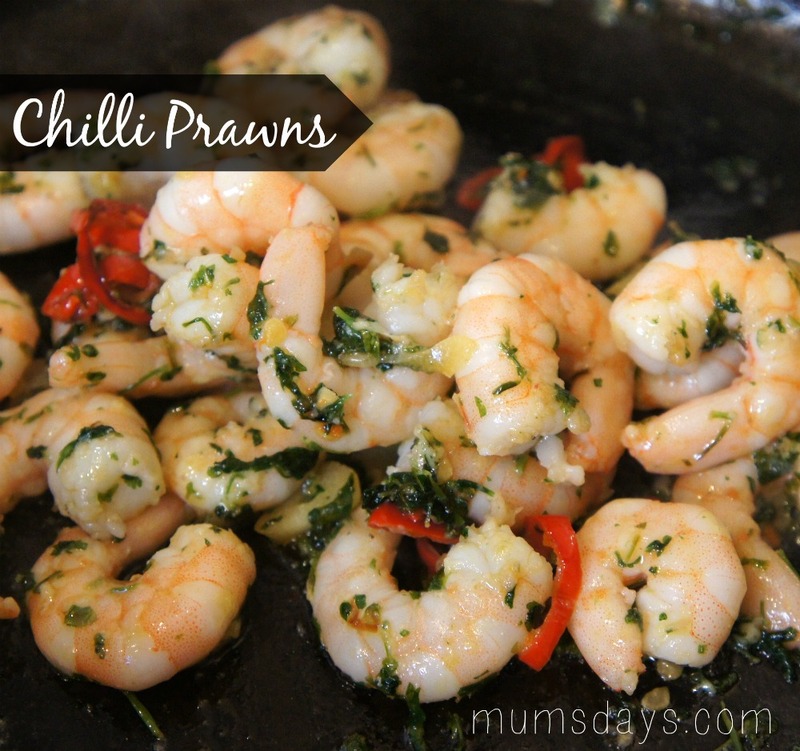 The other nice thing about this dish is the chilli prawns are really versatile. I love ‘em with pasta, but you could equally have them on their own, tapas style, or with rice (I haven’t tried but I recon you could!) and I bet they’d be delish over some mashed sweet potato. But what of the Paleo, gluten free bit I hear you cry?! 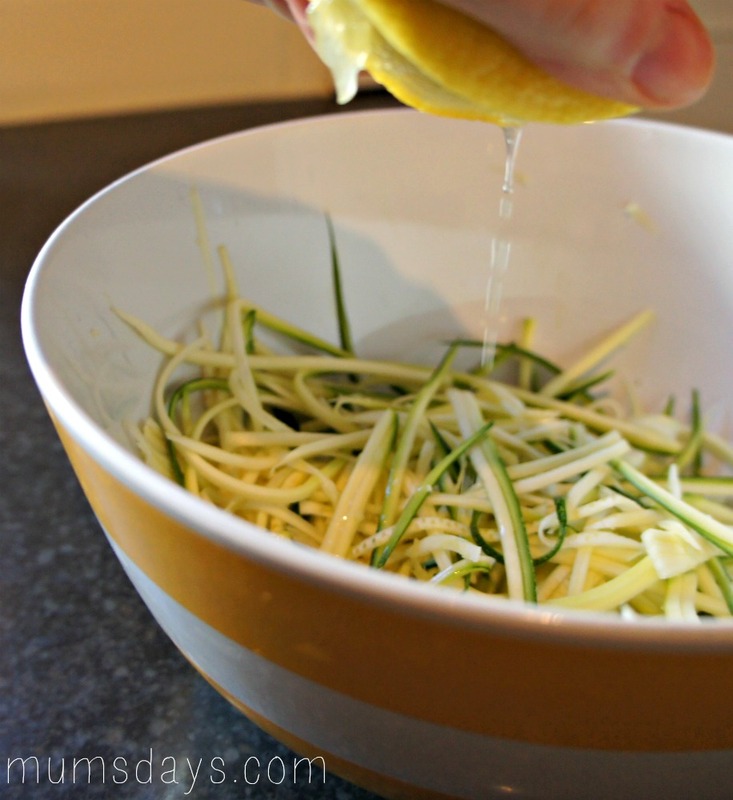 Well, today I’m going to show you how to do it with courgette linguini. I know it sounds wrong but stick with me because this is one mother freaking awesome (as in big!) lunch for one, amazing hangover grub and it’s special enough to really impress your friends as a dinner party starter. This gourmet comfort food is a totally healthy winner! 1. Put your best frying pan on a low heat with a generous helping of olive oil. 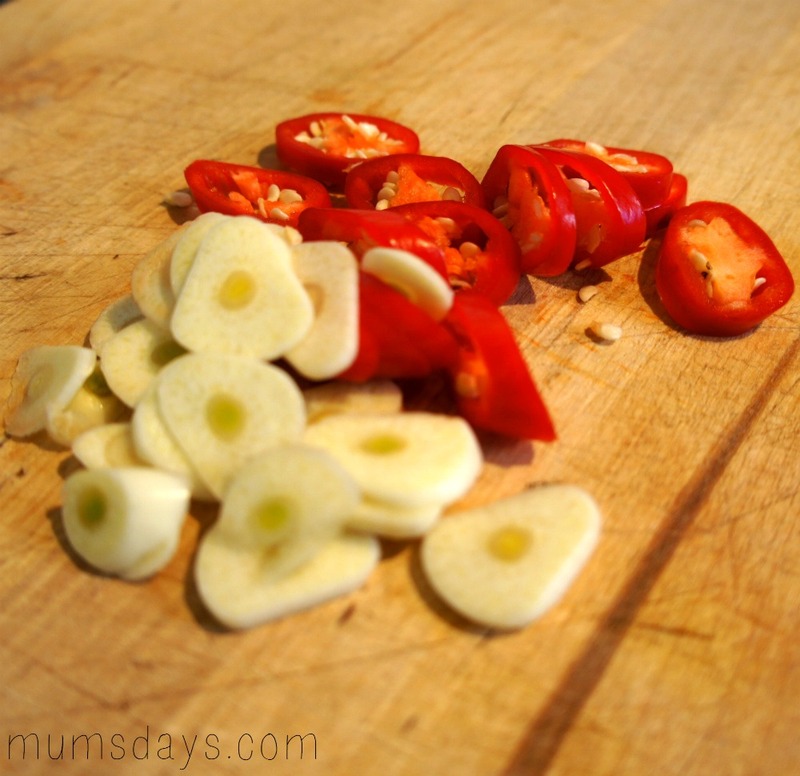 Then slice the chilli and garlic. You could also mince the garlic but I’m a bit lazy so prefer to slice. 2. 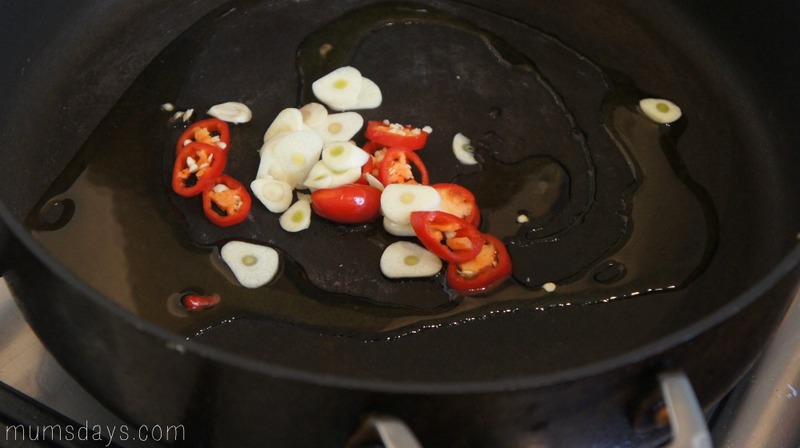 Pop the sliced garlic and chilli into the pan and mix with a wooden spoon to give the garlic and chilli a nice coating of oil. 3. 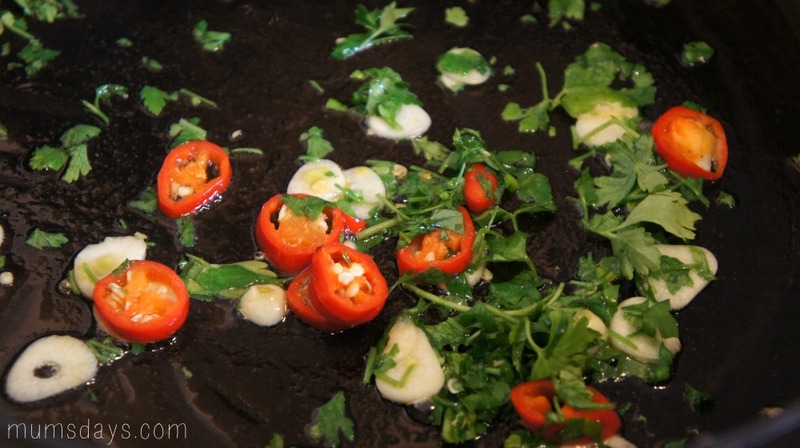 Roughly chop your parsley and add this to the pan, again stirring to coat it in oil. 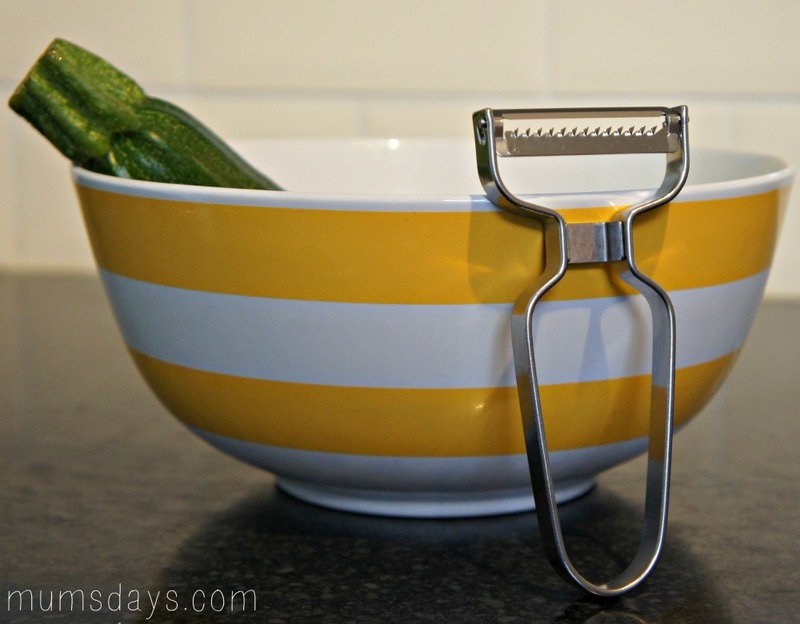 For this you need a contraption called a Julienne peeler and you literally peel the whole courgette with this thing. It’s an incredibly satisfying process, but don’t enjoy it too much as those blades are sharp! You can also use a spiriliser but, as my best mate, Alex, put it, they’re about 5 times the price and take up loads of room on your counter. Frugal all the way! 5. 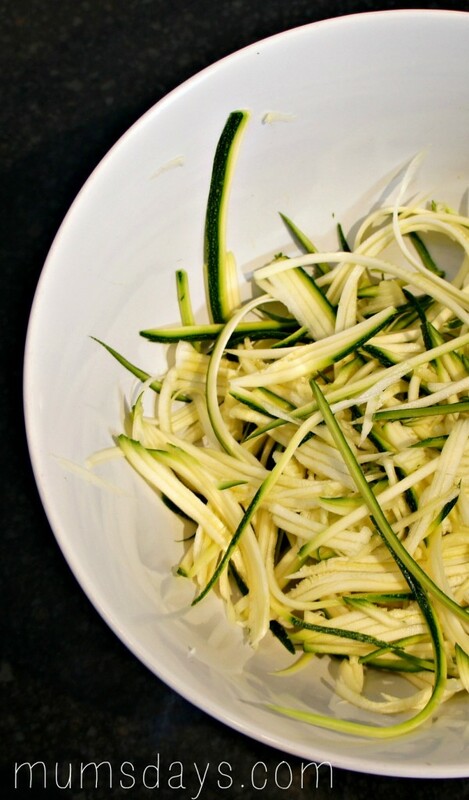 Season the courgette linguini with salt, pepper and lemon juice. You could steam them for a minute or two, but I didn’t bother. 6. Then marvel about the fact that it’s as flexible as linguini! 7. Next you want to check back on your pan – everything should be cooking nice and slowly. Give a final stir then grab your prawns. Now, I’m a huge fan of prawns so I find the portion size you get in a single tub is pretty lame at around 200g. If I was making this for me and Mike I’d be really tempted to use 2 packs! These are delicious jumbo tiger prawns from the freezer section in Sainsbos, and comes in packs weighing 225g. I have defrosted them first. 8. 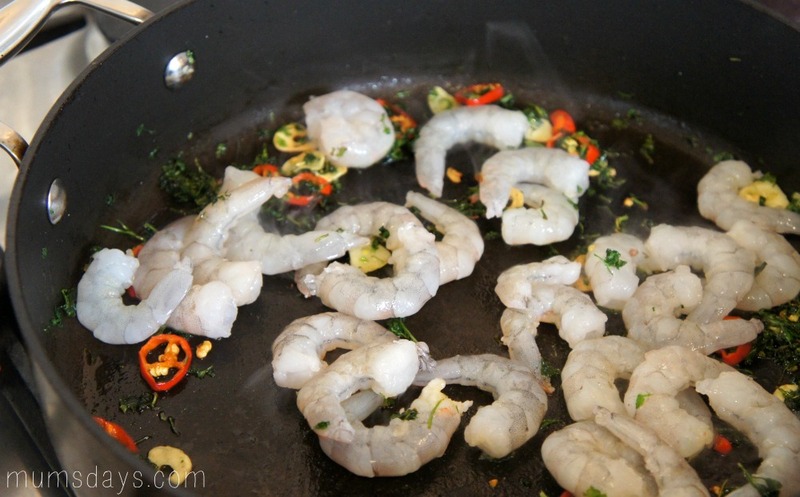 Add your prawns to the pan and stir them in. 9. It doesn’t take long to cook a prawn so don’t over do it or you’ll ruin them! 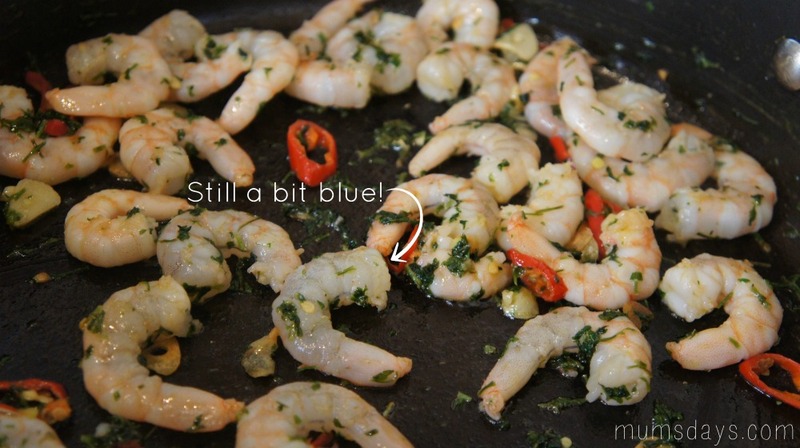 Prawns kind of need an individual approach towards the end, so plenty of stirring but inspect every prawn, you’re looking out for any little blue sections, like in the picture, and be sure to flip them over. 10. 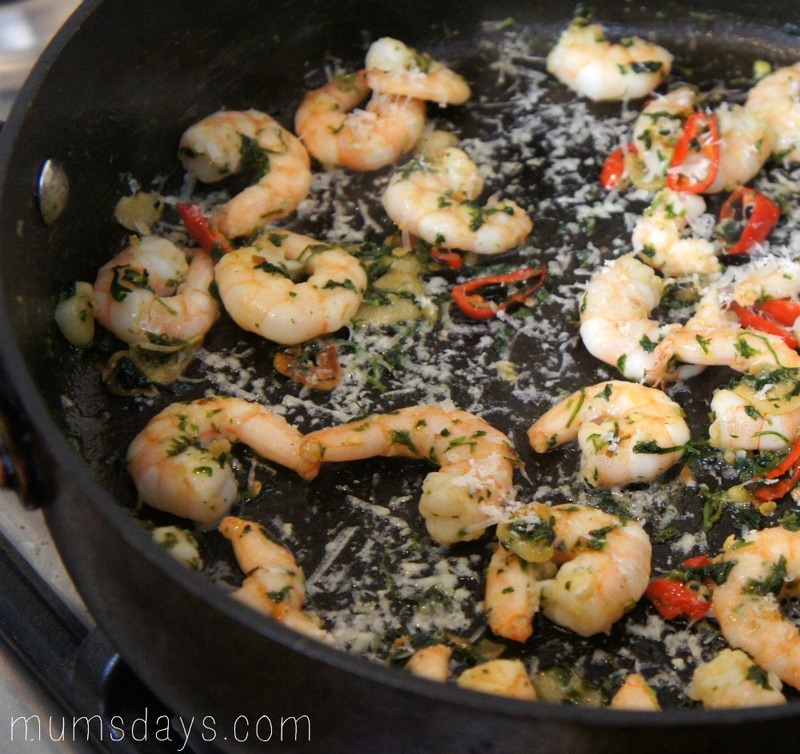 Add the Parmesan to the pan and stir. 11. Once you’re happy that all the prawns are cooked through and this beautiful pinky colour, you are ready! 12. Pour onto your bed of courgette linguini, and season with more lemon juice, salt and pepper, and loads more parmesan and enjoy! 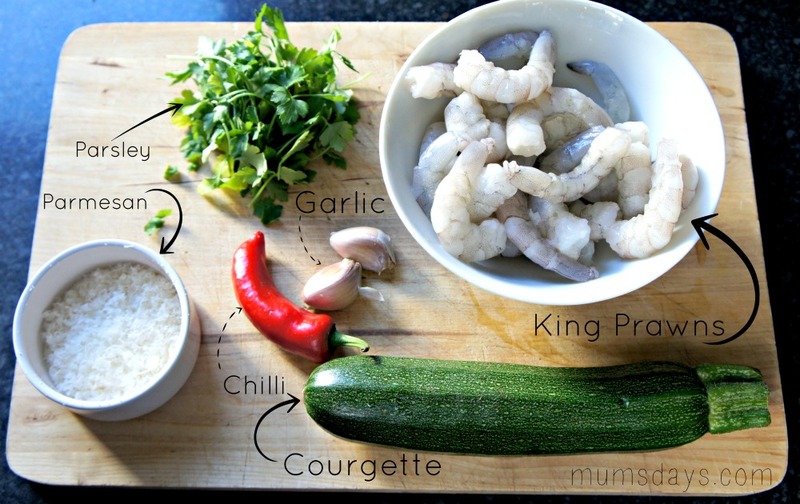 Do you have your favourite prawn recipes?! And what do you think of this courgette linguini? If you’re a fan already, please do leave your tips and ideas for different recipes…particularly prawn recipes! I can’t seem to get enough at the moment! This looks completely scrumptious. I am loving all the different things you can do with a corgette, it really does taste different according to how to cook it! 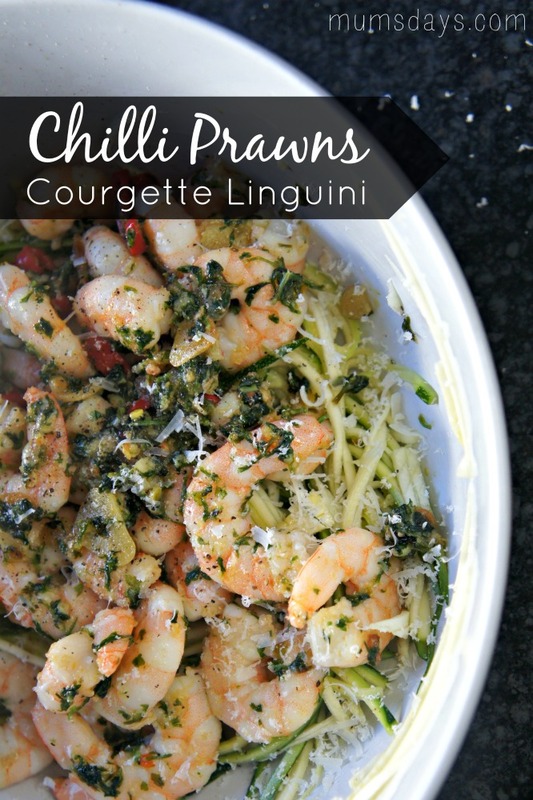 Chilli prawn linguini is a massive favourite in our house. It’s so quick and tasty. I like to add a few halved cherry tomatoes into the pan as well, makes it a little bit more saucy. Oooh I love prawn linguine using pasta but this version looks great. I had thought I’d need to invest in one of those spiriliser things to do ‘coodles’ and that was never going to happen but I’ll have a go with a julienne peeler. The recipe looks filling but in a super healthy way! That looks delicious! Maybe I should get my hands on the julienne peeler! do the prawns heat the linguine up?! Yes! Although mine didn’t because I took so long to take the photos, Laura 😉 Some one over on the FB page said she tried it and popped the courgette in the pan at the end – bloody genius idea as it will then take on some of the sauce left in the pan as well as warming up! I’ve had to pin this on my Shrimp & Prawn board! 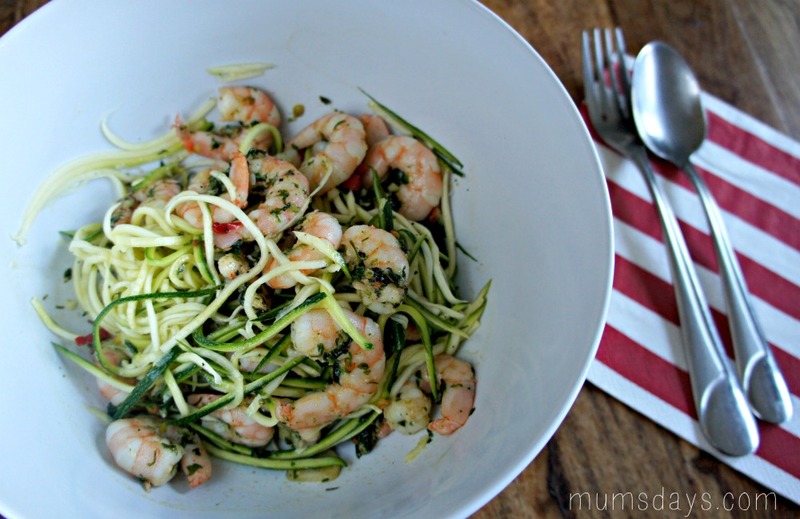 My son is fanatical about prawns – loves them – AND this works for me as I don’t east pasta. So it’s a win, win recipe! This will be perfect for when we hopefully have a glut of courgettes later in the year. 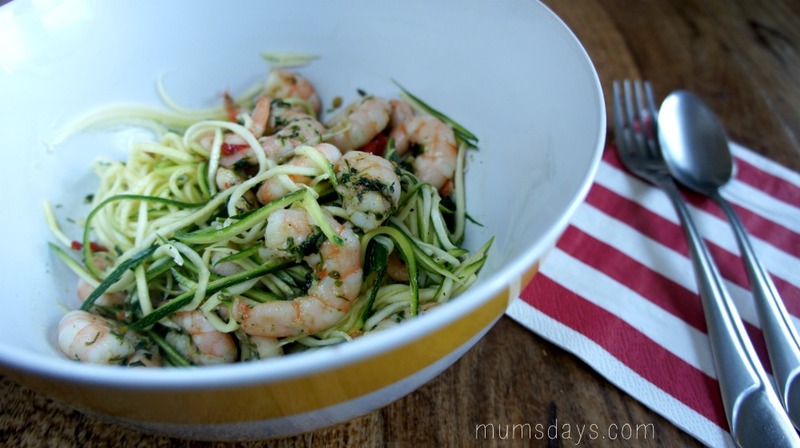 That looks gorgeous, I’m not a fan of prawns though (I’m such a picky weirdo) but I’ve been meaning to give the courgette noodles a go for ages! This looks delicious. 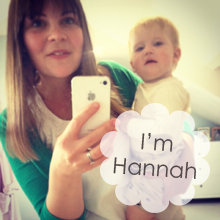 Amazingly my 5 year old is a prawn obsessive so definitely making this for her. Yum Hannah this looks tasty and really healthy. I’m off gluten at the moment too and I’ve been struggling a bit as I miss pasta. I’d forgotten about this corgette version. My sister made it for me once with spag bol and it was lovely. I shall give it a whirl! 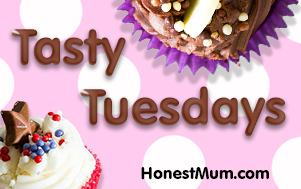 This has made me hungry…roll on teatime. I’m sold!!! I keep hearing about the spiriliser but didn’t realise you could get the same (or similar) effect with a posh peeler! You clever girl you. I am not a fan of prawns but this looks like it would be lovely, I might have to cook it for my husband as he likes prawns but doesn’t get to eat them as much as he would like ! Ooh what a great idea!! 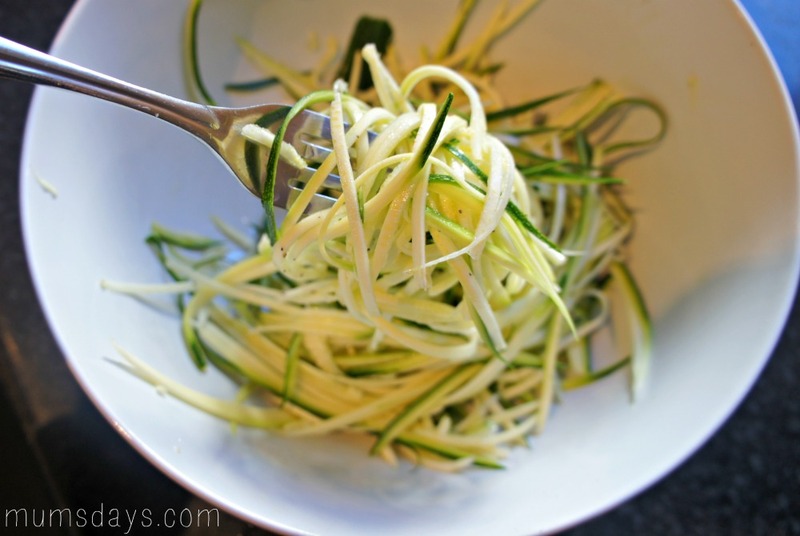 I do a similar recipe with pasta but courgettes would make a great alternative. To be honest, we eat way too much pasta. Looks very yummy, have you tried making cauliflower rice as a carb replacement. I have made it twice now and it’s lovely.